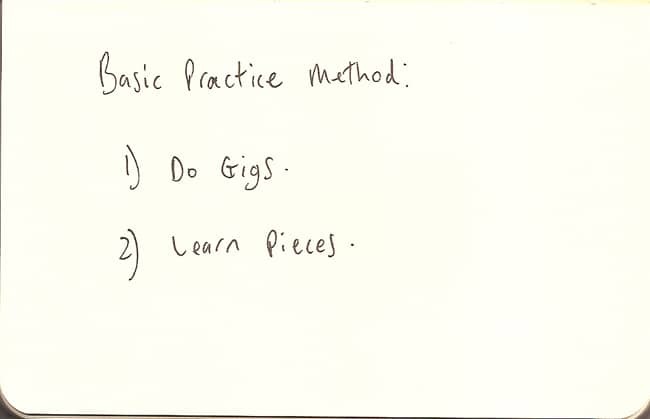 This is my practice routine in a nutshell. This means ANY performance/playing. A gig, a session, a recording, a broadcast, a snippet posted on Snapchat/Instagram/Facebook/YouTube/etc., jamming with your mates, an audition, playing for yourself, playing for an imaginary friend, your cat, whatever. The point is that you’re putting it out there, making it into blood and guts. The point is that you’re putting it out there, making it into blood and guts. Learning things to play. Tunes, solos, ideas, licks and so on.